This WWII ship history stands in a class by itself. 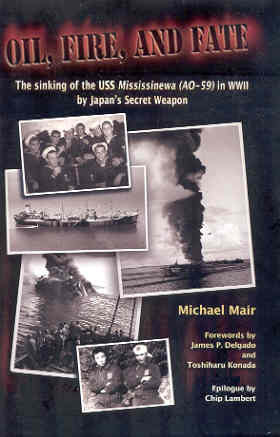 Michael Mair, son of a USS Mississinewa (AO-59) crewman, performed an overwhelming amount of research to write this book. He spent ten years conducting extensive interviews with survivors of this auxiliary oiler that sank when hit by a kaiten weapon at Ulithi Atoll on November 20, 1944. In addition, Mair contacted others associated with the Japanese kaiten attack and Mississinewa's sinking, including members of the Kaiten Association in Japan and veterans of ships at Ulithi Atoll who assisted in the rescue of Mississinewa crewmen. 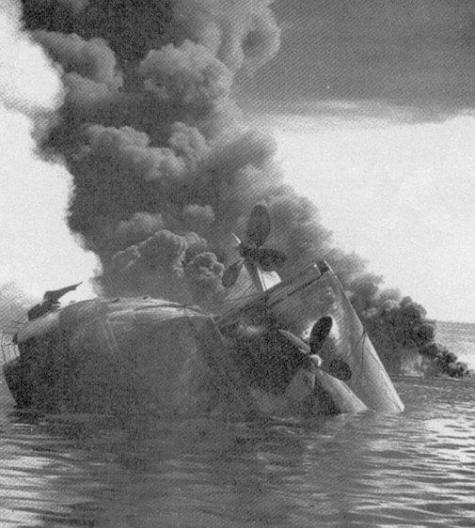 Two Japanese I-class submarines carrying four kaiten apiece participated in the attack on the American anchorage at Ulithi. Before sunrise on November 20, 1944, I-47 successfully launched all four kaiten while I-36 got off only one with the other three jammed in their racks on top of the submarine. The kaiten piloted by Sekio Nishina, co-creator of the kaiten human-guided torpedo, hit Mississinewa at about 0545. The oiler loaded with fuel exploded, flames started spreading rapidly, and crewmen quickly recognized that the fire could not be controlled. Nearby ships sent out small boats that rescued many men who escaped the flaming waters around Mississinewa, but 63 crewmen lost their lives in the kaiten attack. After two short opening chapters, the first summarizing the kaiten attack on Mississinewa and the second about the buildup of the US oiler tanker fleet, most of the book's 14 chapters in general chronological order follow a similar pattern. In each chapter the author describes experiences of various individual Mississinewa crewmen or other persons connected with Mississinewa. Unforgettable chapters include the one where crewmembers describe what happened right after the kaiten exploded and the final one where survivors return home. A few chapters have a different format. Chapters 8 and 9 provide background on kaiten weapons and on the Kikusui mission in which kaiten attacked Ulithi. Chapter 13 analyzes what happened to each of the five kaiten weapons launched by submarines I-36 and I-47. Due to the huge number of eyewitness accounts in this lengthy history, a complete index at the end of the book greatly aids anyone who wants to find stories about specific individuals. Forty pages of End Notes include the names of countless veterans interviewed by Mair. The book also has many wartime photos, including several of the flaming and smoking Mississinewa. The extended Epilogue, consisting of two parts written by Chip Lambert, tells about the discovery of the sunken Mississinewa in April 2001 and the actions taken to deal with oil leaking from the ship. Account after account of the aftermath of the kaiten's hit on Mississinewa refer to certain aspects of the disaster. Many survivors talk about droplets of hot oil raining down on them. Also, quite a few personal stories mention non-swimmers, many who stood frozen in fear at the ship's rail not able to jump overboard. Several mention a Kingfisher floatplane that saved several crewmen. The pilot, Blase Zamucen, received a Navy and Marine Corps Medal with a citation that included the following words: "He taxied his plane to within twenty feet of the blazing oil in spite of the intense heat, smoke, and exploding ammunition and threw a buoyed line to the men struggling in the oil near the flames. Upon towing one group clear of the increasing ring of flames he again approached close to the flames and towed a second group to safety." Japanese sources, including the Kaiten Association Chairman and the former navigator of the submarine I-53, provided much information for the chapters on kaiten and the Kikusui mission. These sources also assisted in understanding what happened to the five kaiten launched at Ulithi Atoll. The background chapter on kaiten uses several extended quotes from Yutaka Yokota's wartime memoir, The Kaiten Weapon (1962), to describe kaiten training and battle operations. The two kaiten chapters also have several wartime photos, including the four-man kaiten crews aboard I-36 and I-47. In contrast to the conclusions above, after I-36 and I-47 returned to Kure Naval Base, the Japanese Navy exaggerated the battle results of the Kikusui mission by estimating that three aircraft carriers and two battleships had been sunk. The huge number of details included in this ship history makes this book very difficult to read from cover to cover. On the other hand, some persons, such as someone associated with Mississinewa, may view these details as the book's strength. Although many personal stories are quite fascinating, the many names make it nearly impossible to remember individual crewmembers from one chapter to another. However, some descriptions of events provide fascinating details, such as King Neptune's Court where Shellbacks who previously had crossed the equator take revenge on the Pollywogs who had never been across the equator. In a humorous event, two Pollywogs try to hide in the potato locker to escape the wrath of the Shellbacks, but their hiding place gets discovered, and they receive additional "punishment" when brought before King Neptune's Court. On the serious side, the collection of personal stories about escapes from the burning ship provide a vivid picture of the panic, horror, and tragedy faced by Mississinewa crewmen. Although the book has many wartime photos, it lacks maps and diagrams. The many place names mentioned make it difficult without maps to visualize the movements of Mississinewa. Page 477 finally shows a detailed map of the Ulithi Atoll, but Mississinewa had arrived there more than 200 pages earlier. One page earlier in the book has a picture of a Navy intelligence map of Ulithi, but the names of the individual islands are so small that they can barely be read. The book does not have a diagram of the layout of an auxiliary oiler, which would be helpful to understand how crewmembers escaped from the ship after being hit by the kaiten. The depth and breadth of research included in Oil, Fire, and Fate make this ship history one of the best written so many years after the end of WWII. The numerous personal stories based on interviews by the author convey the spirit shared by Mississinewa's crew and the tragedy that took place so quickly when the Japanese kaiten rammed into the ship.